Update in January 2019 — I added another source for vintage colored bathtubs that I discovered in 2018 along with additional information and streamlining. 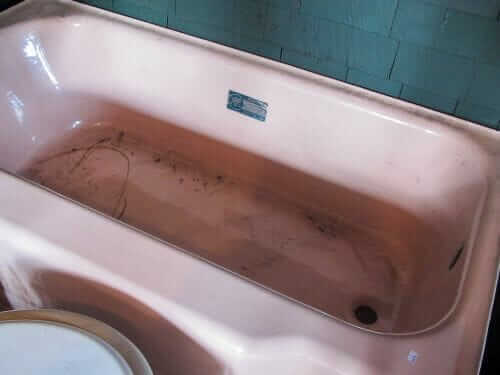 Cindy wrote to ask: Where to buy pink bathtubs? My answer was not an “easy” one: Salvage. Vintage. That’s where you get color bathtubs. No one makes them new, that I know of. I have a home built in 1949 with some vintage bathroom & kitchen pieces but their not in the best condition. I found the blog post on Kate’s pink bathroom remodel but there is no bath tub in her remodel. 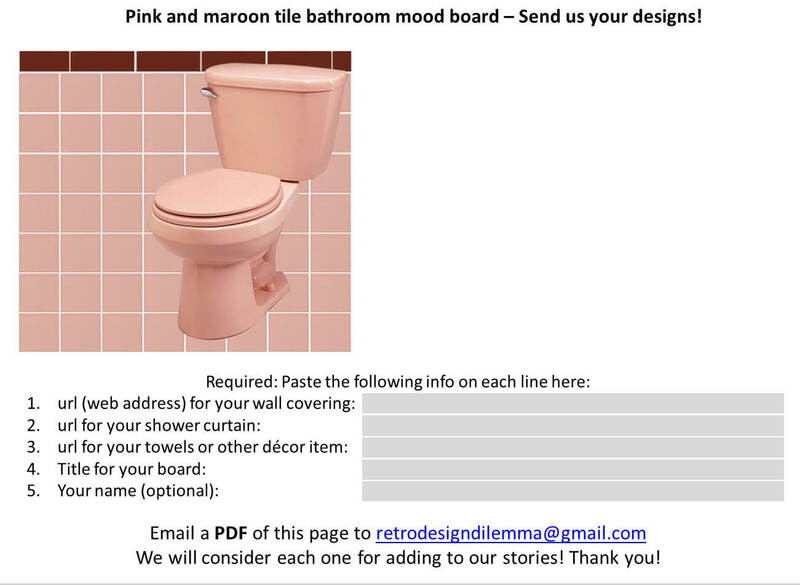 Do you know of any maker of a pink bath tub to match a pink sink and toilet? I will try to salvage my pink sink (picture attached) but hoping to find a bathtub too. I think I read that Gerber or Kohler [Pam corrects: It’s Peerless] make the low flow pink toilet so I’m all set there. Writing this up also reminds me of another email that recently came in. The question was: Should I buy that pink toilet NOW even though I don’t need it yet, in case it is discontinued? I spotted these New Old Stock vintage Kohler bathtubs on ebay and posted them right away. I do tend to write stand-alone stories when I find a big stash. To stay on top of all such stories — subscribe to my weekly newsletter. The “easiest” way to find colored bathtubs is going be from someone else’s remodel. Places to check, locally and regionally: Craigslist, your local Habitat for Humanity ReStore, and architectural salvage companies. NOTE when considering vintage: Be aware of the potential for lead in old tubs, sinks, ceramics, etc. See my story on that issue here and linked on my Renovate Safe page. On craigslist, you can also post what you are looking for in the “wanted” category. I got my bathroom sink this way — someone had an old bathroom sink, saved from a remodel, stored in their basement. For $65, I got the sink, the faucet, and original chrome metal legs with integral towel bars — just a 10-minute drive away. If you have a longtime plumbing supplier in your town — the larger your town, the more you might have — it’s surely worth a try. Give them a call and see if they have old stock in the way back. It’s worked for readers before! Occasionally I get a tip from a reader, or otherwise discover, a hardware store that has unpacked a bunch of New Old Stock bathroom plumbing fixtures from the back of one of its warehouses. 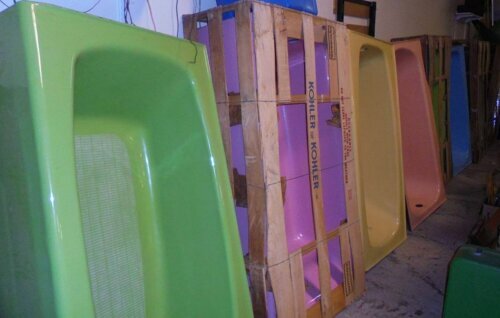 For example, this company still has some New Old Stock vintage bathtubs in color colors. I am not an expert on refinishing old bathtubs with new color finishes. Previous discussions here indicate that finding companies that can do true re-porcelaining are scarce — and it’s likely to be very very expensive. I am not an expert on paint-like coatings: Consult with properly licensed professionals including researching any safety/toxicity issues involved in the proposed process as well as long-term durability guarantees. Note: Here on this blog, I don’t permit readers to make safety or environmental recommendations / opinions, and in general I don’t allow product reviews. See commenting guidelines. 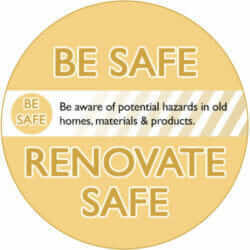 Be Safe / Renovate Safe. If you are building a bathroom from scratch, but can’t find a new colored bathtub you like, you can consider tiling around the situation. That is: Get a white or off-white tub that is meant to be set in tile. When I discover stashed of New Old Stock, I usually write a stand-alone story. A good way to stay on top of my finds is to subscribe to my weekly newsletter. For more research on where to find stuff to restore or renovate a vintage bathroom, go to the Bathroom Help category at the top of the page. Click it. It will open a whole bunch o’ subcategories where you can dig in. Good luck with all, Cindy! Let us know how it all turns out! ReStore Habitat for Humanity locations in the U.S.
Another possibility is to talk to a plumbing contractor. They often take the old ones out of homes to replace with new ones. The plumbing company in my small town has a small lot beside his building with usually half a dozen sinks and toilet stored there before they are ultimately disposed of. I have seen pink, and blue and even a black toilet in the lot there. One source I used to purchase a blue Eljer tub and a blue lavatory sink was Wholesale Supply Group in Cleveland, TN. On their website, they have a list of discontinued items that are for sale. You can inquire to find out what they have in stock at: discontinued@wsginc.com. I had my items freighted to me in Florida using SAIA. Hi Pam. 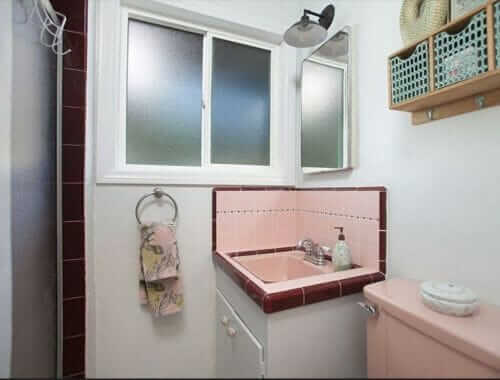 I am looking for a pink vintage bathtub w/ plumbing on the left. I need one that is 50″. Someone took the bathtub out years ago and installed a walkin shower, but the faucet is still there- that is how I know that there was originally a bathtub there. The rest of the bathroom is original. Someone was thowing out an old pink one a couple years ago and I got it, but discovered recently that it is 60″ and the space I need it to go in is only about 50″. Did they make a 50″ bathtub? All the ones on ebay are 60″. There had to have been a bathtub in that walk in shower at one time. Any ideas? Thanks for your help. Yes, they made them smaller, I’ve seen 48″ inchers. Not sure where to point you to get one. Rare to find, vintage. There might be other companies making them new, start the google!